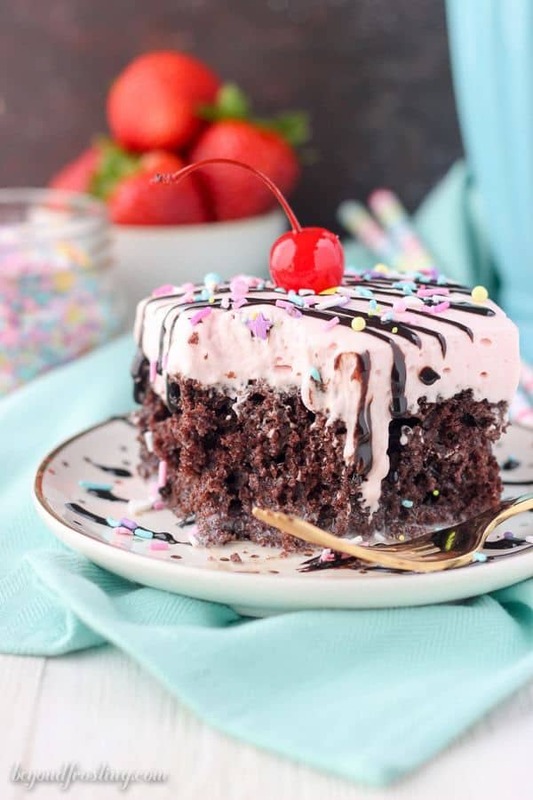 This Strawberry Milkshake Poke Cake is a chocolate cake soaked in sweetened condensed milk and topped with a strawberry milk whipped cream. It’s the perfect amount of sweet to satisfy your cravings. This post is sponsored by American Dairy Association Mideast. As always, all thoughts and opinions are my own. Now that January is coming to and end, I hope that we can all embrace our sweet tooth again because I’ve got this cake waiting to accept you with open arms. Plus Valentine’s day is coming up and I will be eating all the chocolate. I feel like I am saying this a lot lately but I can’t tell you how many glowing reviews this cake has received. I made it on a whim, hoping to test it out on my coworkers before I put it up on my blog. I was not expecting such amazing feedback. One person even claimed it was in their top 5 favorite desserts I’ve made, and I’ve made a LOT of desserts. Mondays at my office are pretty sweet. This Strawberry Milkshake Poke Cake is a chocolate cake soaked in sweetened condensed milk and covered with a strawberry whipped cream. 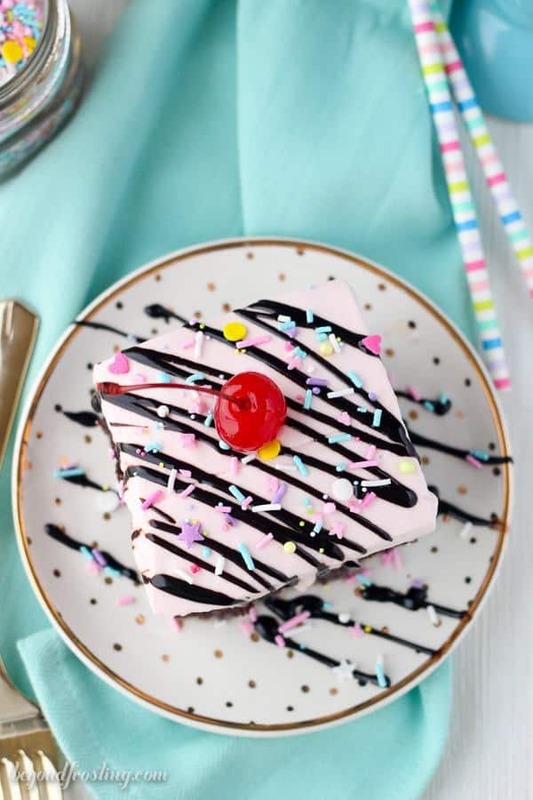 Then it is topped off with your favorite toppings; such as sprinkles and hot fudge. I’ve made my fair share of poke cakes, but they are just so dang good and there are so many flavor combinations, I just can’t stop myself. I’ve had a container of strawberry Nesquick in my pantry for quite some time now. It’s not that often that I make myself strawberry milk, but I’ve been saving it for this cake. Are you a fan of Strawberry milk fan? Then you’ll definitely need to try this! The “frosting” was inspired by my hot chocolate whipped cream. I used a similar technique, adding the powdered Nesquick to the heavy cream once it started to thicken. I also tried a different method where I added it ahead of time to the heavy cream and let it sit before whipping it (so the heavy cream could absorb the flavor) but I didn’t find it was as effective. The flavor is strongest when it’s added directly to the heavy cream as it’s whipping. At first it might appear to be a little bit grainy, but as the whipped cream sits, those granules continue to dissolve. 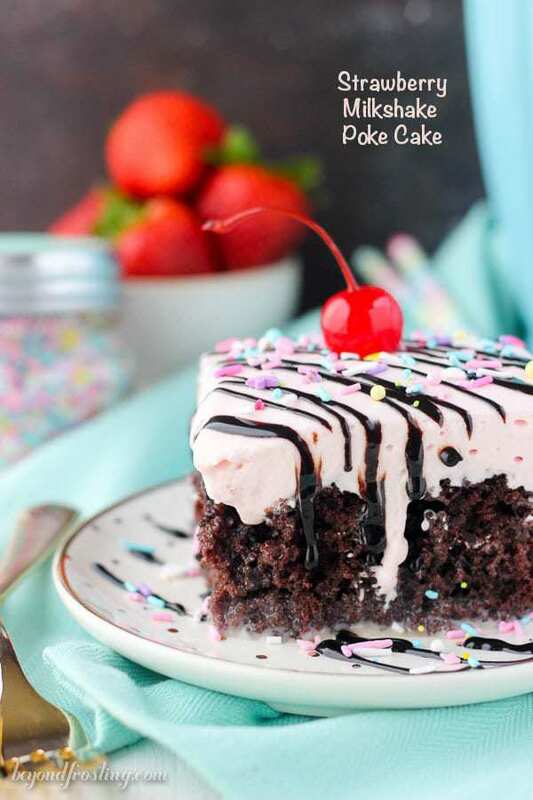 I usually prefer to make my poke cakes using chocolate pudding but the sweetened condensed milk just adds to the milkshake effect here. It might remind you of a Tres Leches Cake, another favorite of mine. This year, I’ll be working with my friends over at the American Dairy Association Mideast (ADA) to bring you moo-licous desserts. Do you all remember my trip to Ohio where I spent a couple days touring dairy farms and learning how milk is processed from the farm to the shelves at the grocery store. Dairy farmers (and pretty much any farmer) never cease to amaze me. 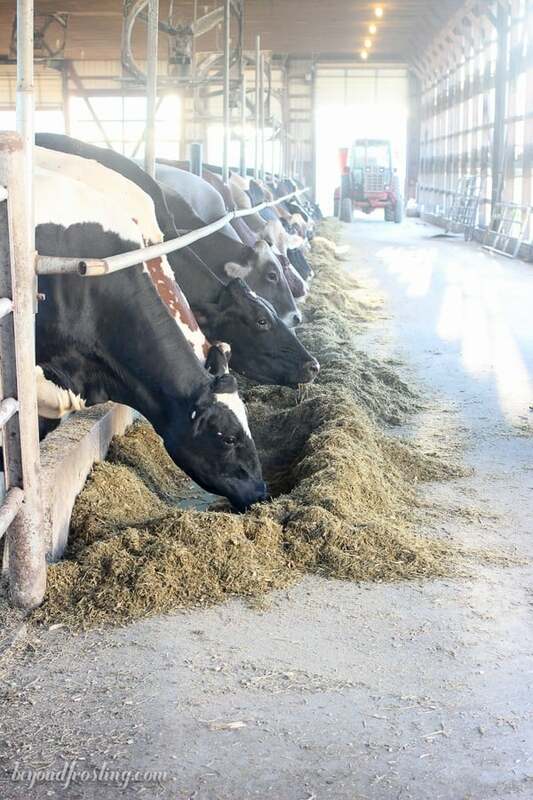 Dairy cows don’t take vacations, so it’s a 365 days a year-type job. We had the pleasure of meeting Frank, who has nearly 700 cows on his farm. It takes a village to care for all those cows, and I loved hearing their story. Personally I am a milk drinker, every morning I drink a large iced coffee with lots of milk. Sometimes the baristas joke that I just want coffee-flavored milk, but they are kinda right about that. I need to make sure I am getting my 9 essential nutrients. 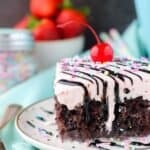 You might also say that I am included in eat a slice of cake for breakfast, especially if it’s Strawberry Milkshake Poke Cake. For more Valentine’s Day recipes, information, dairy nutrition and to meet Ohio and West Virginia dairy farmers, visit www.Drink-MIlk.com, and follow the American Dairy Association Mideast on Facebook, Twitter, Pinterest and Instagram. Share why you love dairy this February using #DairyLove! For the cake: Preheat the oven to 350°F. Prepare the cake according to the instructions on the box, combining the cake mix with eggs, vegetable oil, water (or substitute milk for water). Beat the mixture on medium speed until well combined. Pour the batter into a 9-inch by 13-inch pan and bake at 350°F for 18-22 minutes. Check for doneness by inserting a toothpick into the middle of the cake. If the toothpick comes out clean, your cake is done. Allow the cake to cool for 20 minutes. While the cake is still warm, take the end of a wooden spoon or another round object and poke holes all over the top of your cake. Pour a can of sweetened condensed milk over top of the cake and allow the cake to cool completely and absorb the sweetened condensed milk. For the whipped cream: Put the bowl and whisk attachment in the freezer for 5-10 minutes to get them really cold (this step is optional, but is a common practice I use). In the cold mixing bowl, beat the heavy whipping cream on medium speed for about 2 minutes. Add the strawberry Nesquick powder and the powdered sugar and increase the speed to medium high. Beat until stiff peaks form. Spread whipped cream over the top of cake. 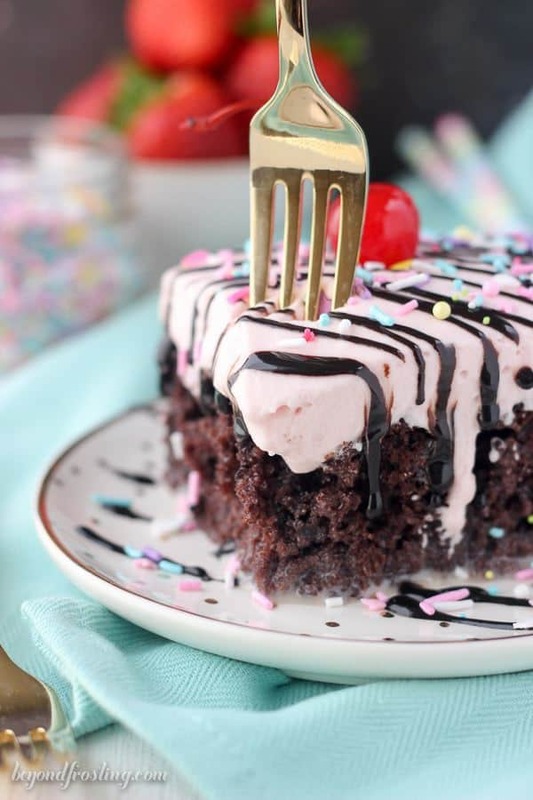 You can top your cake with a chocolate drizzle, cherries and sprinkles. This cake must stay refrigerated. 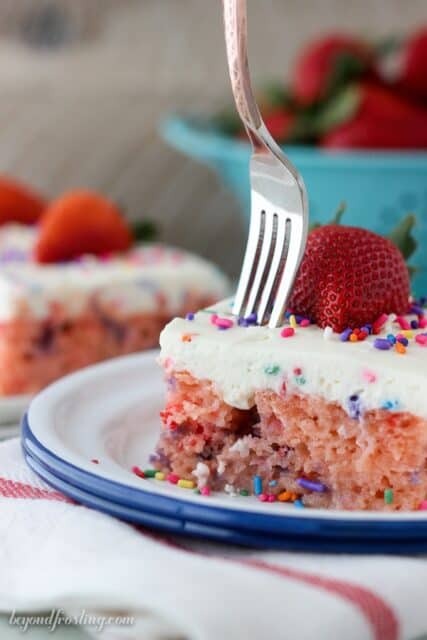 This strawberry milkshake poke cake is FANTASTIC!!!!!!! I purchased your book “No Bake Treats” from QVC and I have made everyone of your recipes. You are absolutely amazing. Your recipes are out of this world!!!! I have been a baker all of my life and I currently bake for my husband’s bridge club. You have a real talent and are extremely gifted. Thank you so much for sharing your baking knowledge and DELICIOUS recipes with us!!! Sandra, that is AMAZING! Thank you so much for sharing! I can’t thank you enough for your support. OMG. This is dreamy! It looks so dang good! I heart those cows!! Also strawberry and chocolate milkshakes are my favorite. I love that now I can have both flavors in 1 (BIG) slice of cake! Me too Erin!! I could spend all day on the farm! 1. These photos are gorgeous. 2. 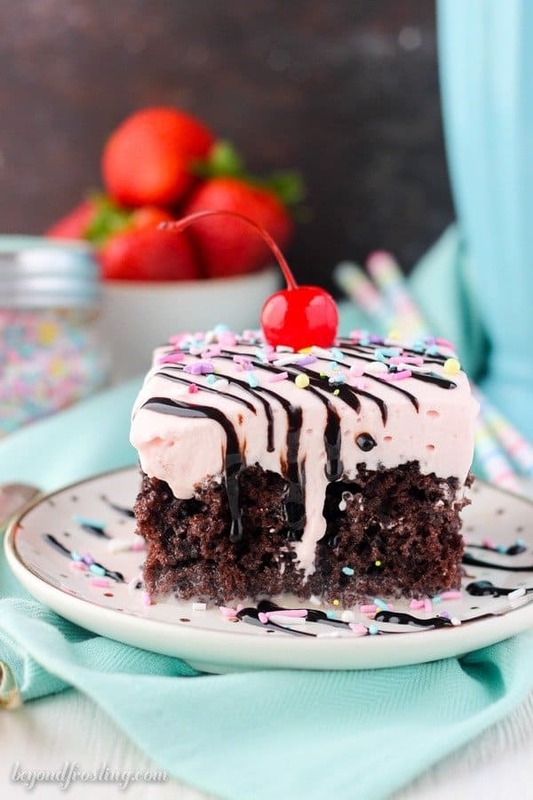 A Strawberry Milkshake Poke Cake? Freaking genius! You had me at strawberry milkshake. This cake looks damn tasty. Thank you so much Jennie! 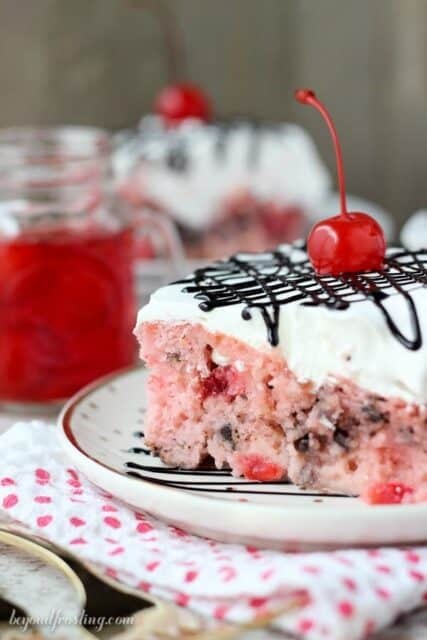 I was wondering if you ever tried making the ” strawberry milkshake poke cake ” with whip cream and strawberry Jell-O mix? 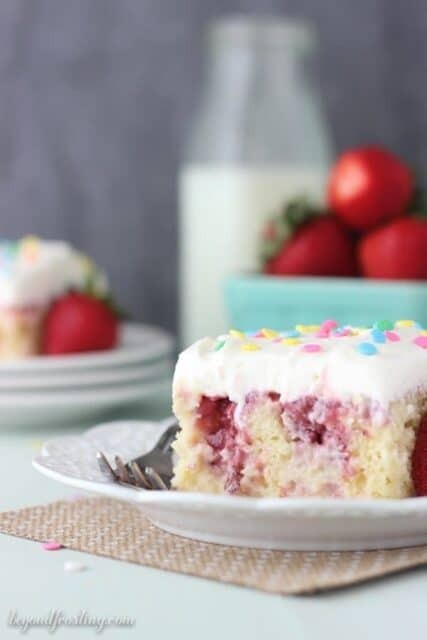 ( I don’t drink used nestle quick; I drink organic rice milk ) I would love to make the ” Strawberry milkshake poke cake ” but with a slight substitution. Hi Linda, thank you for your comment. I think that if you substitute strawberry Jell-o mix it should work out just fine. Add the powdered Jell-o mix once your whipped cream starts to thicken. I believe this will be much thicker than mine, but it should taste good!